Why won’t he enter the judicial process? Why won’t he enter the judicial process, surrender, and then fight the charges? He has cooperated with justice system in the past. In 1998, he was accused of charges and was positively cooperative with the prosecution by appearing in court every Wednesday for several years. At the end, his case was dismissed because the evidence was not strong enough. In 2016, he requested DSI to inform the charge at the temple because he is ill. 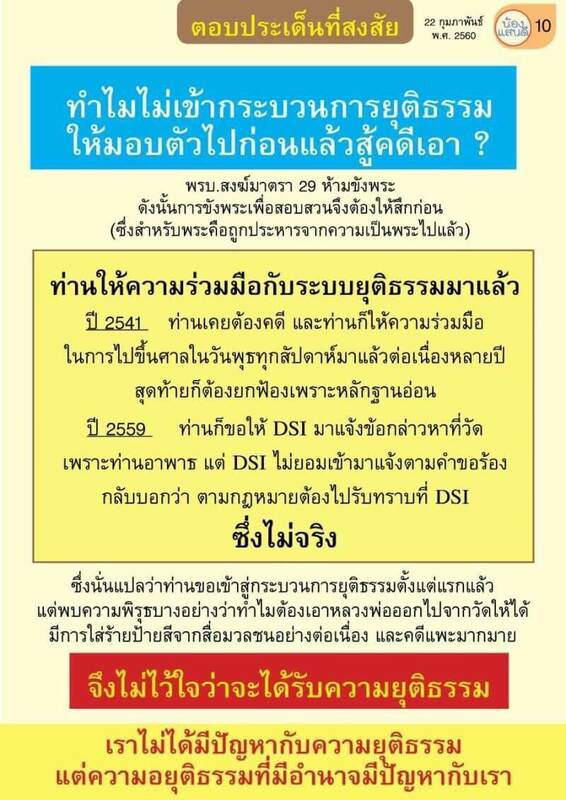 However DSI refused to do so and stated that he has to accept the charge at DSI. Those show that he wants to enter the judicial process since the beginning but the way they attempted to get him out of temple is very suspicious. Not only that the media keeps accusing and defaming him and there are many lawsuits filed against him. So we do not believe that he will receive a fair trial.